Coleraine kept their unbeaten pre-season form going on Monday night with an emphatic win over Glebe Rangers. The Bannsiders ran out 9-2 winners in the end at the Riada Stadium. Ballymoney man James McLaughlin did most of the damage as he helped himself to four goals in the first half. The striker helped himself to his first with only two minutes on the clock as he headed hom Ruaidhri Higgins’ corner. Jamie McGonigle helped himself to a goal shortly afterwards as he coolly slotted in from a clever through ball by Higgins. The third followed almost immediately as Howard Beverland centred for McLaughlin to head home. And the front man completed his hat-trick late in the half as he fired home McGonigle’s cut back. And McLaughlin grabbed his fourth just before the break keeping his composure to fire in from close range to make it 5-0. It could have been a lot worse for the hosts but for three outstanding saves by the home keeper to deny McLaughlin, Sammy Morrow and Darren McCauley. 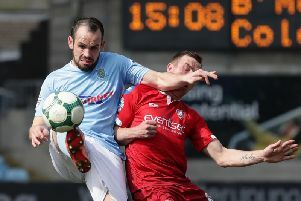 Oran Kearney rang the changes at the break as the Glebe, to their credit, kept going and pulled a goal back just after the restart, Peter Kennoway heading home. The Bannsiders were back on the goal trail again soon after though as Rodney Brown produced two good finishes to make it 7-1. Paul Lyttle pulled another back for the Glebe after they were awarded a soft penalty. However, Coleraine were to have the final say as they helped themselves to another two goals before the end as Ruairi Harkin and Ian Parkhill hit the target.